I would like to take this opportunity to extend a special Thank You to everyone who has stopped by to check out the postings over the year. 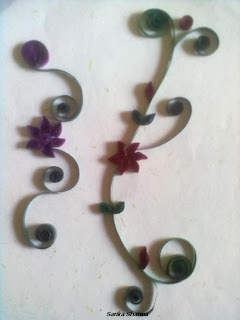 I have come across lots of beautiful quilling designs on net/ exhibitions etc and every time I used to think this is a very difficult craft and takes lots of time. One day finally on insistence of my mother I picked up the quilling materials from Hobby Idea. I started working on the quilling project. To my surprise I found the quilling was not at all difficult as I thought. It needs lots of patience and good imagination. Since being my first try on the craft, I have used very simple design and very less colours. Used only 2-3 colours. I have used recycled CD. Glued the handmade paper on the CD and used it as the base. 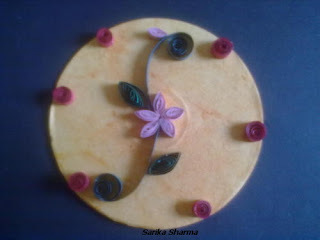 I will be doing more work on quilling, till then bye.